My wife and I recently watched this movie from Netflix. 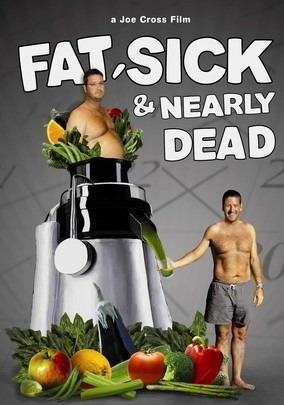 What possessed us to watch it in the first place, I'm not sure, but we have incorporated juicing into our healthy eating regimen. We certainly don't do it every day, but we have tried it two or three days at a stretch each month for the last three months. It was especially useful in losing the 7 pounds I gained on a recent two-week cruise...60 hours of juicing and those 7 pounds were gone. Those that know me know that I enjoy eating and on a cruise I eat things I would never eat at home including desserts. I know these are not good for us, laden with the sugar and processed food, that I rant about, in my e-book and email course on losing weight... you can get that here, it is free. Baby boomer juicing, allows me to have my cake and eat it too, so to speak... I can rapidly and quickly take off the weight that I gained on the cruise. It is a very efficient way of consuming the fruits and vegetables that we all know we should eat more of. I don't know about you but munching on a stalk of celery is not a real exciting way to spend some time... put it in the juicer and the liquid form is much more easier to tolerate, at least in my case. Same way for ingesting fruits, , again I don't much care to munch on apples, oranges, strawberries and the like... they are a lot easier to consume in juice form. For some reason drinking the juice of fruits and vegetables... gives you a feeling of being very full... so I am not hungry for more solid food as we juice. I am not sure what the reason for this is but it's a fact... and if you have trouble dieting this may be something you should try. You don't have to be a doctor, to know that it's easier for your body to process liquids rather than solids. So you are absorbing the nutrients from the liquid form without asking your body to break down the solids that you consume. When we juice, we abstain from coffee and alcohol, this gives our body a chance to reboot if you will. Like I said we don't do this every day, but we do do it 2 to 3 times a day each month... we have four months of experience in doing this now and can't recommend it based upon personal experience... watching the movie certainly helped it was inspirational to see the main character lose 75 pounds in two months and get off all of the prescription medication that he was on... he had some type of disease that he is now free of and is not found it necessary to go back to taking the prescription drugs. I guess we could throw in a raw egg or two when we juice... as a matter of fact we may try that next time. When we stop our juicing regimen, our first evening meal, is usually lentil soup... a good source of protein and not too hard to digest. Remember it cost Esau his birthright, but I really like lentil soup. We report this to you in the hopes that you may add juicing to your healthy eating regimen... it may not work as well for you as it did for my wife and I, I hope so. Incidentally, I ran this by a doctor friend and he replied, " what took you so long to discover juicing"... it's part of his family's regular eating program. rate break We have found that the Jack Lalanne juicer works great for us, and is reasonably priced. Check it out on the right side of the page. Return from baby boomer juicing to how to save on health insurance.